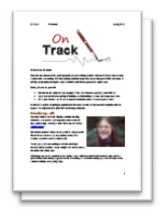 I posted yesterday about On Track, my seven-week writing ecourse. I thought you might like a little taste of the course, so here’s a shortened, modified version of the first lesson. You can also download the whole course introduction for free (pdf). On Track is only open for registrations until this Friday (8th April), so if you want to join the course, I suggest you pop on over to the On Track page now! You’ve got a big project which you’d love to get going. Maybe you started it once – months or even years ago – but it’s been stalled for a while. … well, more like a real writer. It’s absolutely normal to feel a certain sense of reluctance when starting a big project – or when you’re getting back into one that’s lain dormant for a while. The thing is, you’ll never feel quite ready to write. You’ll always think that there’ll be a better time – when you’ve got more energy, when life isn’t quite so hectic, when chores have been ticked off. Writing is hard work – emotionally, mentally – and there’ll always be a great excuse not to write. One of the reasons we get stuck is because we don’t know where to begin. If you have a huge project with no obvious beginning, start with whatever feels easiest. That might be a section of your ebook which doesn’t require much research, or a post for your blog which is straightforward to write. Sometimes, one particular section of a project seems especially attractive. You don’t have to start at the “beginning” – if you’re itching to write Chapter 3, jump in there. Above all, don’t get bogged down deciding where to begin. There’s rarely one perfect place – and you’ll end up with a complete project eventually. If you’re going to write, you need to carve time out of your schedule. Block out at least an hour, ideally two. During that time, you’re going to write. Getting out of your house. Take a notebook and pen, or your laptop, to a local cafe. Setting your writing time an hour before your favourite TV show. If you know that you really do only have an hour, you’re more likely to get on with the writing! Telling other people – your spouse, kids, parents, Twitter followers – that you’ll be writing, and that you’ll need to be left in peace for an hour or two. Really can’t find an hour? Then block out just fifteen minutes – first thing in the morning works well, or straight after dinner. Instead of staring at the blank page, trying to force yourself to start, do a writing warm-up. A blue glass frog falls and breaks. You can write fiction, non-fiction, memoir, poetry … whatever you want. The point is to get your writing muscles moving – you can delete the piece as soon as you’re done. Timers aren’t just great for writing warm-ups. They can help you focus on your big project. There are a bunch of timers around – I tend to use Tick Tock Timer, but you can find plenty of others. When I want to focus on a piece of writing, I typically set a timer for anywhere between 20 minutes and one hour, and while the timer is ticking, I just write. Maybe you feel there’s no real difference between setting aside an hour in which to write, and setting aside that hour with a timer ticking away. All I can say is give it a try – I’ve been amazed how effective this is for keeping me on track. Write down the name of the project you want to get going on. If you want, share it here in the comments. Now, set a timer for 15 minutes and work on your project. You can manage 15 minutes, I promise! Enjoyed this post? You can download the introduction to On Track completely free (you don’t even need to give me your email address). And if you’d like to receive weekly lessons during April and May, and have the chance to interact with other writers and ask me anything at all about writing, then check out the On Track page. By the end of May, you’ll have made serious progress with your project. But move fast – registration’s only open until this Friday (8th April). Ali, this is gold. Like Farouk, keeping the appointment is where I really struggle. I get distracted too easily by shinny objects. This is a useful post, Ali. Since I know too many people, I try to find a secluded corner where I can write. That isolation provides a sense of freedom. I find it difficult to write when there are distractions. Solitude also provides peace of mind to writers. However, all writers are not the same. I know creative people who are multi-taskers and thrive on distractions. They are disorganised and do just fine. Me, I can’t work that way. I guess you need to find what works for you. And then just go out there and do it. Me, being out and about in the woods ignites the creative spark. There is nothing to beat the beauty of natural and scenic rides and views. Away from the hurly burly of madding crowds, one can appreciate the chirping of the birds and the murmur of the brook. And that’s just what it takes to inspire a poem or a turn of phrase for a writer. Cheers. Thanks Archan! I think we all need some degree of space and peace to write … I’ve rarely met writers who did their best work in busy or noisy places. Personally, I find it impossible to write if anyone’s able to see my computer screen — I just can’t get the words out! The great outdoors has always been popular with writers, and I’m sure with good reason; like you say, nature can be very inspiring. Wow, I don’t think I could work with a timer going, but I rarely have problems getting started. Peace and solitude are lovely things too rarely achieved, thus I’ve developed a writer’s snarl (“I’m writing, I’ll be done in ten minutes, please don’t bother me again if you value your life.”) I would be nicer about this to the other member of the household except that if someone is staring at the screen and typing furiously, odds are they are creating something, yes? Nothing wrong with a bit of snarling 😉 My (longsuffering) husband understands that if my study door is shut, I probably don’t want interrupting! Those are a good set of instructions for those who are struck at the beginning itself. Once started the job is easier. We need to set our goal of becoming an established writer and dream about it and the laurels that we are going to receive. This might help us in overcoming the initial bloackade to our task. Thanks Ranjith! I think dreaming about it is good — but actively planning and working towards it is even better. 🙂 And I agree with you that once we get started, it gets easier. I think point three is absolutely critical and I’d take it a step further to say – break down all barriers, and just write. What seems like eons ago now – I recall my college days and my intentional interest in procrastinating, knowing full well that my best writing does indeed come under the greatest time pressures. To some degree I still operate this way (just don’t tell my clients!). But, getting back to point three, so much of school and business life is regimented as it relates to writing – school style, AP style, Chicago style, intro/body/conclusion, executive summaries, bibliographies, yada yada… With all of the formatting – and in some cases the spoken and unspoken expectations (make sure your paper is at least 10 pages long, don’t forget the exact APA citations) the practice of writing is, to some degree, lost in the mix. When I work with others on their writing skills, I recommend they sit down with a sheet of paper and do nothing but write. Some of the best work is created when all of the barriers are down – the formatting can always come later. hi Ali thanks for the four easy stops of wirting a project am much thanksfull God bless you. i was inspired when i red this.thanks so much for the posting.